Dustedoff's last post was on cinematic adaptations of books, and it will perhaps not sound so strange to anyone who knows both of us that the two posts I am working on this week are both adaptations of books. Our coincidences grow, and I have ceased to feel surprised (well, not very much) at them. The first of these films is Chitralekha, based on Bhagwati Charan Verma's debut novel of the same name. I must confess that I read the book long after I saw this version of Chitralekha. I must also confess that the book, a stunning debate between good and bad, morality and immorality, sin and virtue, was far superior to the film. However, the film is dear to me simply because the performances lifted it to a class of its own; it also helped that the music (by Roshan; lyrics by Sahir) was sublime. Besides, it is a period film, set during the time of the golden period of the Mauryan rule, that of Emperor Chandragupta Maurya (345 BC - 298 BC), and I love period films. I also love Meena Kumari; I think she's one of the finest actresses of her time, and woefully underutilised. Like Dustedoff and me, Pacifist, a long time reader loves period films too. When I reviewed Amrapali, she had expressed the hope that I would, one day, write a post on one of her favourite period films. Pacifist, this is for you. Aryaputr Samant Bijgupt (Pradeep Kumar), the commander-in-chief of the Mauryan army returns to Pataliputra to find the city agog with tales of the beauty and charm of Chitralekha (Meena Kumari), the new court dancer. On her part, Chitralekha too is curious about him. However, she has a trick up her sleeve. When she dances in the raj darbar with her sakhis they are all dressed alike, and masked as well. She challenges the court to discover which of the three women is the real Chitralekha. Samant Bijgupt rises to the challenge; though he has never met Chitralekha, he is sure he recognises her. And sure enough, he chooses correctly. Amongst the audience is his fiancée, Yashodhara (Shobhana), who is happy that he has retained his prestige; however, her handmaiden is not as sanguine. Chitralekha, meanwhile, has quite lost her heart to the dashing prince, and knows that she will know peace only when she meets him. It is a hope that is soon to be fulfilled. Bijgupt, who has already fallen for her charms comes to visit Chitralekha; a fact that Yashodhara's friends are more than quick to let her know. Yashodhara, however, trusts her fiancé, and is none too happy to have them sow doubts in her mind. The initial meeting between the prince and the courtesan is not as simple as it seems - she is intrigued by the prince who has neither praised her looks nor vowed eternal fidelity. He is amused. Those are empty words; he has come to love her. Chitralekha is not flattered - all her life, men who have come to visit her have promised to love her, for a day, for a night, for their entire lives. Bijgupt disagrees - they, those men, came to court her for their own ends. 'Love' was just an empty word. But he wants to know - has she ever loved anyone? Of course, she has. Who? Someone whom everyone was in love with - Chitralekha. She, Chitralekha, has only loved Chitralekha. Bijgupt is honest - he has been with many women, but has never loved any of them. Now it is time for him to learn to love. He leaves her, promising to return. His frequent visits to Chitralekha, and their growing attachment are not going unnoticed by his tearful fiancée. Her distressed father calls upon Kumargiri (Ashok Kumar) for help. The yogi, arrogant in his righteousness, decides to visit Chitralekha to turn her thoughts to the right path. Only, his extreme self-righteousness does not sit well with the danseuse who, when asked if she ever remembers God, retorts: Na kabhi ishwar ne Chitralekha ko yaad kiya na Chitralekha ne ishwar ko. One of the most powerful scenes in the film follows as Chitralekha and Kumargiri debate right and wrong. It culminates in a scathing denunciation of the hypocrisy of spirituality. But while his words hurt her, it is Yashodhara's selfless love for Bijgupt that tears Chitralekha apart. When her own people Mahamaya (Bela Bose) and Gayatri Devi (Achla Sachdev) declare that true love is selfless, she recalls Kumargiri's words about the ephemeral nature of youth and love. It forces her to take a hard look at herself, and the even harder decision to leave Bijgupt, much to the latter's grief. However, Kumargiri is not as welcoming as he should be. Chitralekha, who has come to him in the hope that he will offer her deeksha - initiation - is not to be thwarted of her goal. She has renounced everything - her wealth, her previous life, her love for Bijgupt. Now she has come to him so she can learn how to renounce self. Her argument reluctantly wins him over, and he's forced to let her stay. Back in Pataliputra, Bijgupt is undergoing the pangs of a lost love. He finds voice in an outpouring of grief that questions the futility of life itself. Mood and music, man and voice meld together to bring to life on of Hindi cinema's finest odes on love and loss. While her abode is readied at Yogi Kumargiri's ashram, Chitralekha is staying with her guru. The yogi soon realises that his much-vaunted tap is as susceptible to her charms as he assumes his disciples to be. In fact, Neelkant, his disciple has only respect for Chitralekha for having renounced her life to embrace sanyas. His guru, on the other hand, is beginning to realise that arrogance is as much a sin as any other failing. Chitralekha is at once his temptation as she is the voice of his conscience. She argues that tapas is attained not from giving in to temptation but from the ability to resist it. When he claims that he is afraid of her, she rebuts the argument - he is afraid of himself. His desires, which he had overcome, have come to life again, and they toll the death of his spiritual accomplishments. How will these tangled skeins unravel? Will Kumargiri be able to contain his desire for Chitralekha? How far will he go to attain that desire? Or will he take Chitralekha's exhortations to its logical end? Samant Bijgupt has made up his mind to keep his promise to Chitralekha and marry Yashodhara. What will happen to Shwetank who, unwittingly, has fallen in love with the young maiden? What of Yashodhara herself? Does she have a will of her own? And Chitralekha? Will she realise that there are many different ways to salvation? 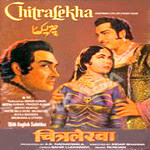 Kidar Sharma had already made Chitralekha in 1941 with Mehtab in the title role, and it proved to be the second-highest grosser of the year. (This was also Bharat Bhushan's debut film.) More than two decades later, he remade the film casting Meena Kumari in the title role. Unlike its predecessor however, the 1964 outing was a box-office disaster, not the least due to its (mis)casting. Director Kidar Sharma did his best, making sure the camera angles were such that they were mostly of her upper body and face, which, despite the ravages of time, still had more expression than most contemporary heroines can manage today. Similarly, it was hard to see Ashok Kumar as a yogi in his prime, vaccillating between lust and his spiritual desires, or Pradeep Kumar as a young, rugged, lovelorn prince. They just looked too old. The comic side plot that had Mehmood as Shwetank, Bijgupt's gurubhai was at once unnecessary and integral to the plot. As the brahmchari who is sent to Bijgupt to learn about sin, he is worked for laughter. He also gets two versions of Maara gaya brahmchari. As the niggling voice of good, he is instrumental in some of the most philosophical dialogues in the film. As when Chitralekha, upon hearing why he was sent, wonders why his guru didn't send him to her, and Shwetank caustically asks her whether she knows the difference between sin and virtue. Chitralekha's answer is touching - who better than her to differentiate between the two? Besides, who decides who the sinner, who the saint? It leads to one of most poignant scenes in the film, where Chitralekha narrates her life story to Bijgupt. She says Yeh meri apni kahani thi, Bijgupt. Shuru me suna di ke anth mein tumhe mujhse ghrin na ho. Yet despite all its flaws, Chitralekha manages to hold, and keep my interest, even while rewatching, and for that, I have to acknowledge the stellar performances; the chemistry between Meena Kumari and Pradeep Kumar was as evident in this as in their previous pairings over the years, and they, and Ashok Kumar did much to keep you engrossed in this tale of love and redemption. The story is definitely the soul of the film, and after these many years, still holds relevance to the basic philosophical dilemmas that arise out of human desires. Kidar Sharma, who was also responsible for the dialogues, comes up with some pithy and scorching remarks on the issues that are addressed. It helps that the most dramatic of these debates are between Meena Kumari and Ashok Kumar; fine actors both, they manage to keep the tone restrained, yet make their points without beating us over the head with it. Their scenes together should be required watching for anyone who has dreams of making it big on the marquee. If you can look past the age of the actors versus the age the characters should be (in the book), I would unreservedly recommend this film. It certainly does fulfil Kidar Sharma's much-vaunted stance of entertainment with a social message, and unlike many of the genre, does so very subtly. Sansaar se bhaage phirte ho.... one of the fundamental principles I've adopted in my life. For one to realise God, one should discharge his/her responsibilities to the fullest. A wonderful review, Anu. I had watched this movie on Doordarshan as a kid. Brought back memories of those days. A scene from the climax did stick in my mind, but would not want to write a spoiler here. For one to realise God, one should discharge his/her responsibilities to the fullest. restrained, yet, so powerful! I'm glad you liked the review, Shashi. Thanks. Brilliantly written Anu! Poor Roshan, in spite of this being one of his best scores, had to be content with Mara Gaya Brahmachari making to the top 20 of Binaca Geetmala, IIRC. Thank you Anu, for this honour :) I'm really pleased that you have reviewed the film. I haven't read the novel though. Would love to read it in hindi. In fact I'll try at amazon. But, is Chitralekha supposed to be very young? IIRC wasn't there a scene when a maid doing her hair finds a grey strand? Chitralekha is reminded of the fact that beauty isn't lasting, and will fade away, and that she's getting old. It helped her to make the decision of renouncing the worldly pleasures. Meena Kumaris face looks beautiful though, and the camera lovingly takes shots of her best angles. Meena Kumari's face is so expressive here. You're welcome, pacifist. :) Yes, do see if you can get your hands on the novel. I read it aeons ago, and would like to get a chance to read it again. Maybe I'll scrounge around and see if I can get it in India. In the novel, Chitralekha is a young widow, who becomes a nautch girl. It wasn;t her age, so much as the dissipation in her face that made it seem so miscast. And her size! :) But I love Meena Kumari anyway, and she's such a fantastic actress that she makes you forget everything else. And you are right - Meena Kumari doesn't shed a tear. And her voice! Oh, her voice! She uses it to such great effect, doesn't she. I always thought that this film is a big no-no. Songs good, bad film or at least bad execution! Your review has made me want to watch it! Would love to read it as well. The costumes btw look more like that of XVIth century rather than that of IIIrd BCE. But who knows how the costumes at that time looked like? Harvey, do, do watch it. It is not a bad film *at all*! Like Harvey, I kept away from watching this film because I just assumed it was going to be 'songs good, movie bad'. Your review is making me rethink that opinion. I may still not like it but your recommendations haven't let me down yet. Will let you know after I watch. Hi Anu, Just wanted to let you know that my next set of songs are up for grabs on you tube. Click on my name to view one of those. This is for Great Indian Talent singing competition. Hmmm, true. Very often a novel and a movie do tend to make us 'love' or 'hate' the characters to different degrees. My take on that, will be I look for points of similarities which maked me like a novel. The differences in the treatment of characters - I just ignore them. That way, I try and get the best of both the words. It happened very recently with "Day of the jackal". I read the book, and I have seen the picture again recently - I can understand that Meena Kumari nowhere fits the physical description given of Chitralekha, but why do you say she made a mess of the character? I agree that when we read a book, we have a mental image of the character based on the descriptions, and that the actors chosen may not always fit that; Madhu's post on film adaptations of books relates that very well. Shashi, can't think how I missed this! Thanks for letting me know. Sorry if I have hurt you...I compared Chitralekha of the novel and Chitralekha of the movie...In novel, as you would agree, she is portrayed as a very intelligent person while in the movie she is almost reduced to be a mere dancer,drunk.As you have mentioned in the opening lines of your review,the debate was about good or bad,morality/immorality,sin or virtue,the writer has taken up the matter very sensibly and concluded that there can not be a lakshman rekha and depends on the circumstances of each person. And for conveying this,Chitralekha's character was instrumental. I exactly dont know when the movie was shot..but Meenaji had hangover of her Sahib Bibi Ghulam portrayl. I am a great fan of meena Kumari..its that just in this movie...it didnt work..
P.s. Nice to know that you have read the book..reading hindi literature is almost out of fashion..
No, you didn't hurt me. I was genuinely curious why you felt that way because I thought, despite the drunkenness (and that, only in a couple of scenes), she came across as very intelligent; in fact, she is the one who is the voice of Kumargiri's conscience; she is the one who asks the very thought-provoking questions... or makes up her mind. Do keep dropping in, and commenting - there is always room for dissent. It would be very boring if everyone agreed on everything all the time. This is one film where you *should* find the time, Madhu. I'd love to see what you think of it.